We stretch for 3 reasons: injury prevention, injury treatment and function. If done properly, stretching increases flexibility and this directly translates into reduced risk of injury. A muscle group with a greater range of motion is less likely to pull or tear when used during activity. Stretching also improves recovery and may enhance athletic performance due to improved biomechanical efficiency. Additionally, increased flexibility of the neck, shoulders, and upper back can improve respiratory function. Lets stick with function. Healthy muscles let enable you to naturally move through greater ranges of motion, which will make your daily activities easier and make you a much better athlete. There are 3 methods of stretching: static, ballistic, and proprioceptive neuromuscular facilitation (PNF). 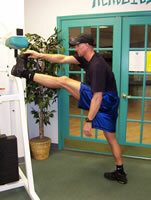 The pictures below are great static stretches which should preferably be done after activity when the body is warm.